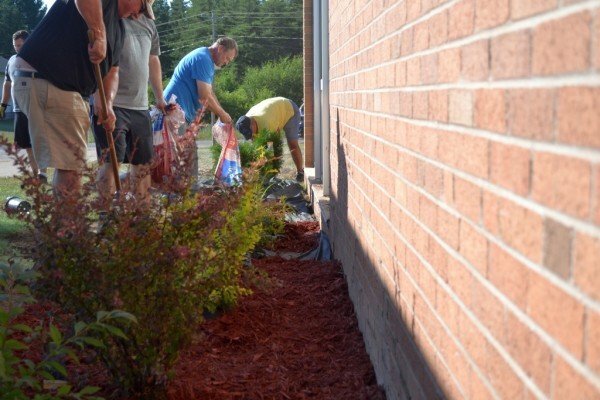 Gwinn, MI – Gwinn parents, teachers and community members all gathered to clean up Gilbert Elementary School during a Work Bee to prepare for the upcoming school year. Many people expressed generosity and community spirit by donating a bit of their time to help make Gilbert better than ever for all the kids here in Gwinn! A lot of work was done during the Work Bee on Wednesday. 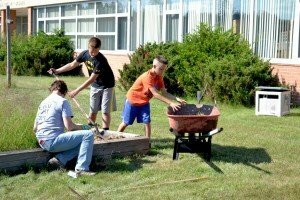 Volunteers painted playground equipment, removed shrubs, added a new sandbox, replanted flowers around the building, spread new woodchips, painted doors, and overall just spruced Gilbert up! Gwinn’s new Superintendent Tom Jayne was on hand, and helped the team landscape the front yard of the school. Volunteers arrived around 4pm, with many staying until it started getting dark out. With all that work, we had some hungry volunteers. Good thing the grill was loaded with hot dogs ready for the hard-working friends. There was plenty of food and great music, and many happy faces helped improved the school for the upcoming year! Thank you to all that came out and supported Gwinn Area Community Schools, the heart of the Model Town! Don’t forget to mark your calendars! The Sawyer School Cleanup is scheduled for August 19th, 2015! Next Story → ‘Meet the Modeltowners’ Kicks Off the 2015 School Year at Gwinn High School!